Karl Linn has left us: Berkeley Daily Planet. Pagan anarchist Holocaust survivor, early kibbutznick, Karl fled the Nazis, landed in Palestine, and left for Switzerland and America before the formation of the Israeli state. In a dialogue group once he indignantly refused to be counted as an Israeli. He didn't really want to be counted among the Jews when we totaled up who was who in the group. He said he was a citizen of the world. Karl was more critical of Israel than I was willing to be, and pushed me to the left during long heated dialogues about Israel and Palestine. I listened to him because despite his feeling of "not being really Jewish", his criticisms of Israel came from his love of his people and his ideals. He was not bashing Israel out of hatred, he was demanding that Israel live up to principles of justice. He also said that without Zionism, he would have been killed by the Germans, and he was lucky to have landed in Palestine; he would then say that because he was saved, an Arab, or many, had to lose their land, which saddened him. This central paradox perplexed him, and was perhaps the driving force around his dialogue group efforts. (italics indicate edit - I wanted to change and expand on a previous comment). Karl was a child psychologist and a landscape architect; at the end of his life he built community gardens. The East Bay Jewish-Palestinian dialogue group hosted many picnics in the Peralta Peace Garden that Karl founded. "Throughout these last 75 years, what really happened to me made me realize how important it is to live in a society that’s based on tolerance and multiculturalism. I was born and raised on a farm in northern Germany, and I grew up in this incredible 15 acres of fruit trees. And during springtime, when all the trees were in bloom, it looked just absolutely incredible. Just like a fairy land. "The farm was about half a mile away from the village, and we were the only Jewish family in a huge, huge region. I know how difficult it was for me as the only Jewish kid. When Hitler took power in January 1933, my schoolmates suggested that I join the Hitler Youth movement because they had a lot of fun going camping and had a real sense of community, and I knew I couldn’t do that. "And a few months later they realized that I was the only convenient target to practice on, and from time to time I could hear the Nazis’ goose-step as they walked down the cobblestone street towards the farm, checking the house out and threatening us. And my experience with racism motivated me to devote my life to contribute to the emergence of a humane society. That’s the way I’ve attempted to live my daily life. To create joy and possibility that’s inspiring, but underneath it all, there’s a lot of pain. A lot of pain. "We never know what will happen with the future, and I concluded how important it is for me not to be a pessimist or an optimist, but a “possibilist,” to create possibilities of working with people creating life-supportive, life-affirmative small projects that could be inspiring and enrich people’s lives." Sierra Club profile of Karl Linn. 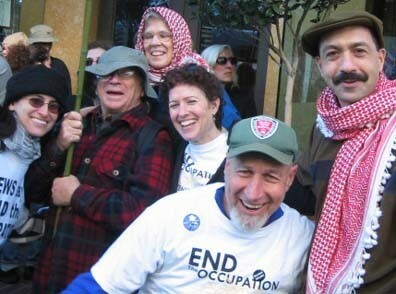 Finally, a photo of Karl (in red plaid shirt) surrounded by friends, Jewish, Palestinian and other (including my mom, in keffiyah at back), taken at one of the San Francisco demonstrations against the Iraq war, spring 2003. Karl died at his home on Thursday February 3, 2005, surrounded by family, at the age of 81. (corrected, thank you Khalil B.) His love of humanity, his mystical reverence for the Earth and her fruits, and his intelligent perceptions of the Israeli/Palestinian situation inspired me. I will always be grateful for his friendship. Blessings upon his soul. UPDATE: My mom wants to clarify that she doesn't normally wear a keffiyah. It was a very cold day in SF, she had forgotten her hat and scarf, and the keffiyahs were on sale at the march. I was deeply saddened to hear that Karl had passed away. I took out the little booklet he gave me in the fall of 2002, "Shattered dreams in the contested holy land", and read it again. I missed the opportunity to discuss it with him and convey my appreciation. Karl was a victim of the Nazi regime but he has liberated himself in a way I haven't seen before. He was free of nationalism, free of cynicism, fully open to the humane, the pain and the good in each person. Like the peace pole he planted, Karl was a symbol of humanity, a symbol of hope, a possibility of healing and reconciliation. In these days of shattered dreams, Karl's departure it is a huge loss of a very special, courageous and inspiring man. But his work - his gardens and the seeds he planted in my heart, as well as many other hearts - will stay with us. I'm in tears over Karl's passing. What a truly wonderful human being and an inspiration to us all ! If only his wisdom, his humanity, could have touched more Jews who support the horrible oppression that the Israeli government is exacting on the Palestinian people and are suffering so much themselves for this. We must all take upon ourselves to finish Karl's wonderful work. Karl was/is my great uncle and he will be deeply missed. We visited him up in Boston for an awards ceremony and that is when I really got to know him. He showed me around and explained his life's aspirations. 'Ullie' as we know him was such a kind hearted man, hopefully his work will continue to change people for the better. Karl's passing is felt as a "disturbance in the force," by those of us working to protect the land and create a more sharing, equitable society. May we live the lessons he left us. Karl Linn was one my professors at New Jersey Institute of Technology. With a group of fellow students and community members, we maintained a garden in a lot next to a church in Newark New Jersey. Karl's extraordinary talent and vision of creating an empty lot into a "Garden Oasis" will stay with me all my life. Karl gave back to the community through his knowledge and desire to make the world a better place. After graduating he hired me as his assistant for an Architectural design class...although I had my diploma and thought I knew everything...he probably taught me more then. I kept in touch with him a for short while but always thought of him when I dug in my own garden.